There's a surging hunger among teenagers for Jesus. New research shows that they want a clearer understanding of what Jesus really said and did, and how faith in matters in their lives. In fact, that desire is so deep, it's #1 on their "wish list" for what they'd like to talk about at church. But are we doing that? Even though we assume that everything we do in youth ministry is about Jesus, the evidence is clear: That's not what our students say they're experiencing. So what would a youth ministry look like if it shifted toward a passionate, persistent, and permeating focus on drawing students into a closer orbit around Jesus? Inside the pages of Jesus-Centered Youth Ministry, you'll discover the foundation for a ministry that is Jesus-centered, along with the bricks for building it. You'll discover that not only is it possible to create this kind of ministry, it's also essential that you pursue this path. 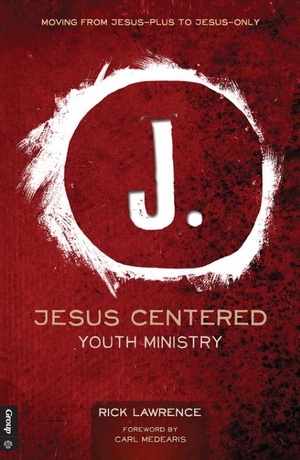 Eight years after his book was first published, introducing the language and structure of a new way of doing youth ministry, author and longtime Group Magazine editor Rick Lawrence has completely rewritten and revised Jesus-Centered Youth Ministry. It's packed with new insight, new research, and dozens of field-tested ideas for planting and nurturing a ministry environment that is Jesus-magnetic. Help satisfy teenagers' hunger for Jesus in richly nourishing and sustaining ways by shifting the orbit of your ministry. If your church does it, they’ve probably got it. It’s been said that tool companies don’t sell drills; they sell holes. The same goes for Group. They don’t just sell books, curriculum, training, Bibles, software, etc. They're in the business of making you even better at what you do in ministry. They want you to feel joy and fulfillment as you connect people with Jesus. That said, Group does offer a wide range of resources and services for just about every area of church ministry: children’s ministry, youth ministry, adult small groups, women’s ministry, pastoral ministry, and more.